Soon after Abraham Lincoln issued the Emancipation Proclamation on January 1, 1863, abolitionists began to call for the creation of black regiments. At first, the South and most of the North responded with outrage; southerners promised to execute any black soldiers captured in battle, while many northerners claimed that blacks lacked the necessary courage. Meanwhile, Massachusetts, long the center of abolitionist fervor, launched one of the greatest experiments in American history. 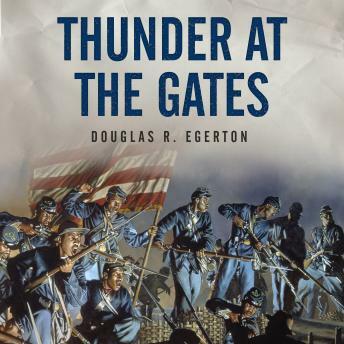 In Thunder at the Gates, Douglas R. Egerton chronicles the formation and battlefield triumphs of the 54th and 55th Massachusetts Infantry and the 5th Massachusetts Cavalry-regiments led by whites but composed of black men born free or into slavery. He argues that the most important battles of all were won on the field of public opinion, for in fighting with distinction the regiments realized the long-derided idea of full and equal citizenship for blacks.